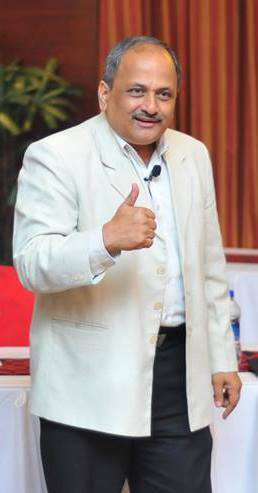 Mr Ajit Sadanand Kaikini was born in Udupi in 1955 and did his schooling in Mumbai. He got his B.Pharm degree from Manipal in 1978 and developed interested in training through the Jaycee movement. Thus, the name of my company ends in cee – Buoyancee – where people can bounce back, to float in life. Starting his career as a Medical Representative he toured many places & learnt a lot from the people he met and the places he travelled. First 5 years he spent in Sales/ Marketing and the next 5 years in Production. He quickly grew in the corporate ladder and was promoted to Admin/ Training. 15 yrs later, in Dec. 1992, he along with his wife started Buyancee, to empower children, to show them better ways of living in life. Looking at the impact, he extended the training to schools/ colleges & corporate. Now some doctors in NIMHANS suggest Buoyancee as an occupational therapy which they say results in positive changes. Buoyancee is the only one of its kind training institute, which reaches out to the poorest, the richest and from age 3 yrs onwards with no upper limit. While every parent, teacher & manager tells their juniors to do well, nobody gives them the where and how of change. That became his mission. He attended a lot of courses, discussed a lot with psychologists/ trainers and found his own ways and means to support those who wanted to change. Buoyancee now has created history by helping non-performers to be champs, stagnated companies to surge ahead with ease – all by working on their human excellence. Post profiling, he finds specific needs, counsels individually then in groups, to help them perform better. After all, each is born out of the winning sperm – born winners but conditioned by his care-takers to lose. Comparison & criticism are the greatest weeds, which hinders the human seed from growing & going in their best possible way! With the help of Indian Oil Corporation, Canara Bank, Rotary & Lions, IDF & Utthana, team Buoyancee has conducted free training in the slums & villages, schools & colleges, institutions & corporate, in India & Europe, and has been recognized by Ratan Tata Trust as ‘India Leaders for Tomorrow’, Rotary ‘Institute Par Excellence’, Lions & GKP as ‘Social Entrepreneurs’, Rex ‘Karmaveer Award’ and many more. They have free programmes for housewives & the senior citizens. Free training for the underprivileged and spread social messages about Oil conservation, Friendlier families, Happy Married Life etc. Ø How Would you describe yourself in one word? Ø Give an Example of a time when you solved an analytically difficult problem? Ans: Relational problems between parents & children (especially broken homes) / husband & wife/ & many with low self-image & self-confidence who had performance issues. Ø How old were you, when you had first achievement? share somethingabout that? Ans: At the age of 20, as a student in Manipal, I had the privilege of saving 6 girls from drowning in theMalpe sea. This recognition crashed through my self-image problems & boosted my morale. This I realized changed my life. Buoyancee was started with the same principle & it now helps its participants to face such situations through activities. Expose, Explore, Experiment, Experience, Evaluate to Emerge is our formulae for change! Our participants give rebirth to themselves. The impact is so good that it is helping companies too. We also conduct training for the teaching staff, to help them connect with their students &to make classes interesting. Over 10,000 teachers have been trained also, over 2500 engineering college lecturers through the World Bank aided TEQUIP project. Now I train all over India in 6 languages. Ans: Nurture Your Nature to Be Mature, & for a Better Future! Ø Tell us about an accomplishment you are most proud of? Ø Whom do you like to credit your role model as --- Why? Ans: My father Sadanand Kaikini who started his life selling agarbatti’s on Grant Road railway station Mumbai, joined a company as a worker, and rose up to be the MD of the same company. I can tell a lot about his ways & means & life. Ø You spent long journey working, any observations about the challenges that are specific to your profession? Ans: Training is given the least importance, though it is vital. During tough times, training is the first on the roll for cost cutting. When the company is doing well, they are too busy and they have no time for training. Many Indian companies conduct training, only to meet the ISO requirement. Ø Which is your best achievement? Ans : Bringing about a positive change in dejected/ rejected teens/ youth with low self-image/esteem. Positively changing percentage pass in Govt schools. Being successful in being part of many change initiatives of companies – ITC’s e-chaupal to uplift villages, Bisleri 500 ml launch, Sutures India doubling growth in nearly a year and supporting many more company change initiatives. Ø Tell us about a situation causing the feelings of regret in your career? if any? Ans: My slogan “Find Facts, not Faults” has helped me keep regret & guilt away. Ø What message you want to pass for our upcoming generations? Ans: Be Your Best to Better Your Best! You can’t make jeans with a shirt material. Texture is the nature of the textile and its property decides what you can make. Similarly, we have our own nature, depending upon our Talents, Interests & Personality which form our property. Our Beliefs & our Perspectives can make or break us. Have Clarity in your Thought, Purity in your Thinking for Surety in your Things that you get – Aspire as per your Property, Perspire with Inspired Activity, Acquire with Dignity! Ø What motivates you to get out of bed for a hectic work area every morning? Ans: Willingness in the heart & Will-power in the mind, supported by the right blend of people who bond and having a common goal. With such a team, work is never hectic but magnetic (effortless effort like the flowing river)!